The Silvertize Cloth is an exciting new cloth containing 10% silver that is supposed to kill 99.9% of bacteria, viruses, and fungi. The company claims that it kills germs whether the cloth is wet or dry. They say that it is great for hands, phones, electronics, and many other things. If you don't want to read all of this page, click here for the spoiler results summary. The cloth is made of cotton which the company says is critical for the production of the germ-killing silver ions within the cloth. They say that artificial fibers (like microfiber) don't produce silver ions as well. The Silvertize company asked me to test their cloths and sent me a few free cloths to test. Here is the packaging mine came in. The company has since updated their packaging. I tested the Silvertize cloth to see if it kills germs and how well it removes germs from surfaces. I did not test it on hands. Skin has so much natural bacteria that it is hard to see how much is removed. Does the Silvertize Cloth kill germs? I tested several cloths for the ability to kill germs, including the Norwex cloth, and the Silvertize cloth is the only one that appears like it might actually kill germs. You can see all of the results and the complete experiments on this page. Here is a brief summary. I washed my entire kitchen floor with cloths, including the Silvertize cloth, and got the cloths very, very, dirty. Then, I blotted the dirty cloths on agar plates as the "before". Then I rinsed the cloths in warm 90°F water for 30 seconds and blotted them again. Next, I hung them up to dry for 24 hours. After 24 hours, I wet the cloths in tap water and blotted them onto agar plates again. The agar plates were incubated in my warm 90°F incubator for 48 hours. In case you are new to looking at agar plates, the whitish/yellowish dots on the plates are colonies (or piles) of millions of bacteria. Not all types of bacteria can grow on these agar plates. Viruses can NOT grow on these agar plates. Yeast, mold, and fungus CAN also grow on these plates. In general, the more colonies that grow on the plate, the more germs there were on the surface that was tested. However, a clean agar plate does not necessarily mean that no germs whatsoever were present on the surface because not everything can grow on an agar plate. As you can see, a lot of bacteria died in the Silvertize Cloth compared to the other cloths. So, it does seem like the cloth might really be killing germs. Please note that when you are using the Silvertize cloth to wipe off phones and keyboards, it is not going to get as filthy as I got it for this experiment. The Silvertize cloth might have an even easier time killing germs when it isn't as saturated with dirt as it was in this experiment. Please read my "Which cleaning cloths kill germs" page if you want more details from this experiment. How well does the wet Silvertize Cloth wipe off germs? In these experiments, I swabbed cell phones and a computer keyboard before and after wiping them for 30 seconds with a wet Silvertize cloth. I wet the cloth in warm 90°F tap water and thoroughly rung it out. Then I wiped the phone (or keyboard) off for 30 seconds. I did the best possible job. Then I swabbed the phone all over (except for the edges that I was holding) and rubbed the swab onto an agar plate. The plates were incubated for 48 hours in my warm 90°F incubator. The wet Silvertize cloth did a great job removing germs from these items. I also tested how well the Silvertize cloth removed germs from a dirty section of my kitchen floor. I swabbed the floor before and after wiping with the Silvertize cloth. Again, the wet Silvertize cloth does a good job picking up dirt and germs. How well does a DRY Silvertize Cloth wipe off germs? 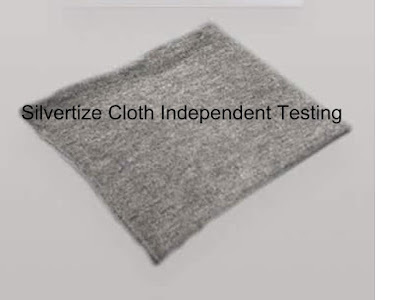 The Silvertize company also claims that the cloth kills germs even when dry. For this experiment, I wiped the phones with a dry Silvertize cloth all over for 30 seconds. I swabbed the phones before and after and rubbed the swabs onto agar plates. The plates were incubated for 48 hours in my warm 90°F incubator. It is hard to imagine that any dry cloth would clean as well as a wet cloth. So, I'm not surprised that the dry Silvertize cloth does not get the germs off phones as well as the wet cloth. The company advertises that the cloth still kills germs even when dry. I am not contradicting that claim. The cloth may still kill germs even when dry. However, my results show that the cloth is unlikely to get germs off a surface as well when it is dry compared to when it is wet. It may still kill whatever germs it did pick up when dry. I have many more experiments to do! If you would like to suggest a product for testing or have a comment or question, email me (phd.annie@gmail.com). Learn more about me here. If you would like to be informed when new results are posted, you can join me on Facebook or sign up for my email list. Don't forget to subscribe to my YouTube Channel. If you would like to help support my work, consider using my Amazon affiliate links when you shop on Amazon. If you click to Amazon using any of my Amazon links, like this one for my daughter's book, I get a small percentage of the sale no matter what you buy. I use that money to buy all the agar plates and supplies that I need for these experiments. If you don't want to bother using Amazon affiliate links, you are welcome to make a small donation through PayPal.